Beautiful home in the prestigious neighborhood of Vista De Oro. 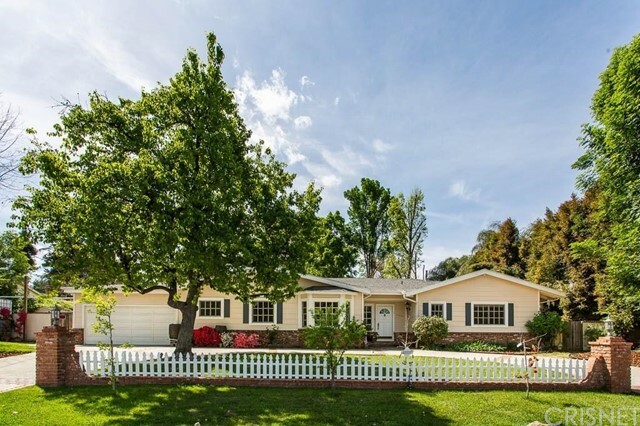 Large flat 16,919 sq/ft lot with circular driveway & picket fence entry. Inside you will appreciate the spacious entertaining area with lots of natural light and beautiful wood floors. The home has 3 fireplaces, one of which can be found in the large living room right off the entry. There is also a formal dining room and family room w/ vaulted wood beamed ceiling, rustic brick fireplace and bar. There is a bathroom off the family room area. The kitchen has a nice island w/ sink, double oven, gas cook top and breakfast area. Direct access garage & lots of storage space. Master has a large walk-in closet, fireplace and French doors leading to the backyard. The master bath has double sink vanity, bathtub & shower w/ a rain shower head. The backyard has a beautiful gated pool w/ solar cover. The yard is both large and private with many great features: natural playground, 5 raised beds for gardening, many fruit trees (orange, apple, lemon to name a few). There is also a small office/play house complete with its own A/C. Other improvements to the home include, LED lighting, copper plumbing, paid off solar, tankless water heater, soft water system, reverse osmosis for drinking water and rain collection system. Close proximity to Warner Center and the new Village as well as all the shops and entertainment on Ventura Blvd. Great hiking in Topanga Canyon and easy access to Malibu and Santa Monica beaches. Based on information from CARETS as of 4/26/2019 9:23 AM CST. The information being provided by CARETS is for the visitor's personal, noncommercial use and may not be used for any purpose other than to identify prospective properties visitor may be interested in purchasing. The data contained herein is copyrighted by CARETS, CLAW, CRISNet MLS, i-Tech MLS, PSRMLS and/or VCRDS and is protected by all applicable copyright laws. Any dissemination of this information is in violation of copyright laws and is strictly prohibited. Any property information referenced on this web site comes from the Internet Data Exchange (IDX) program of CARETS. This web site may reference real estate listing(s) held by a brokerage firm other than the broker and/or agent who owns this web site. The accuracy of all information, regardless of source, is deemed reliable but not guaranteed and should be personally verified through personal inspection by and/or with the appropriate professionals. IDX by Commissions Inc.